We talk a lot about the California Environmental Quality Act (CEQA) around here. Few other laws have shaped the development landscape of California so dramatically; among other things, it’s the reason the Millennium Hollywood project has taken so long to get off the ground, and why a community plan update for the neighborhood around it fell through in 2013. But we don’t often discuss the basics of the law and why it looms so large in California politics and land use. With that in mind, let’s take a closer look at the policy and its impacts, particularly in Los Angeles. The California Environmental Quality Act was signed into law in 1970 by Governor Ronald Reagan, a year after the National Environmental Policy Act was implemented at the federal level. As concerns about water quality and smog mounted in California, lawmakers sought to create a state bill that would supplement the new federal law with even stricter standards regulating pollution and preserving the natural environment. CEQA was crafted by a newly formed committee on environmental quality in the State Assembly. The law requires California’s public agencies and local governments to measure the environmental impacts of development projects or other major land use decisions, and to limit or avoid those impacts when possible. If a developer wants to build a new shopping center, for instance, they’ll have to address the project’s likely environmental impacts first. These can range from the traffic created by vehicles coming in and out of the parking lot to the removal of trees on the project site. Agencies have to study the impacts of public projects, private developments that require local approval, and even planning decisions that don’t directly result in new development—such as new community plans. Under CEQA, most development projects have to prepare some form of environmental report. In many cases, that takes the form of a negative declaration, which indicates that the project won’t have a significant impact on the environment. For larger projects, like new light rail lines or sports arenas, an environmental impact report (EIR) must be prepared. These lengthy documents examine all potential environmental impacts (on air quality, traffic, aesthetics, and more). Once a draft report is prepared, it’s circulated to the public for review and comment. Following the review process, a final report is prepared, which must ultimately be approved by the agency reviewing the project. Both negative declarations and EIRs contain extensive information about projects that members of the public, as well as local officials, can use to evaluate development plans. Most projects aren’t big or disruptive enough to require an EIR, but when they are, the local approval process necessary to get these developments underway can take years to complete. How does the state make sure these rules are being followed? As explained by the California Natural Resources Agency, CEQA can be “enforced, as necessary, by the public through litigation and the threat thereof.” In other words, if an agency allows a project to move forward without proper environmental review, members of the public can sue. This is one of the most controversial elements of the law. Supporters say it gives communities meaningful oversight over developments that will affect their quality of life. Opponents say it allows anyone who doesn’t like a project to block or delay it with legal challenges. Sometimes, these lawsuits prevent construction of new housing in California, where 526 cities are failing to meet state-monitored housing goals. Have CEQA lawsuits affected projects in Los Angeles? Yes. Local developments impacted by CEQA include the previously mentioned Millennium Hollywood development, as well as the long-stalled Hollywood Target. Developers of the Reef, an enormous South LA development, are weighing their options after a local nonprofit used a CEQA lawsuit to secure more affordable housing for the project. How has the law impacted LA? The longterm effects of CEQA are harder to quantify. 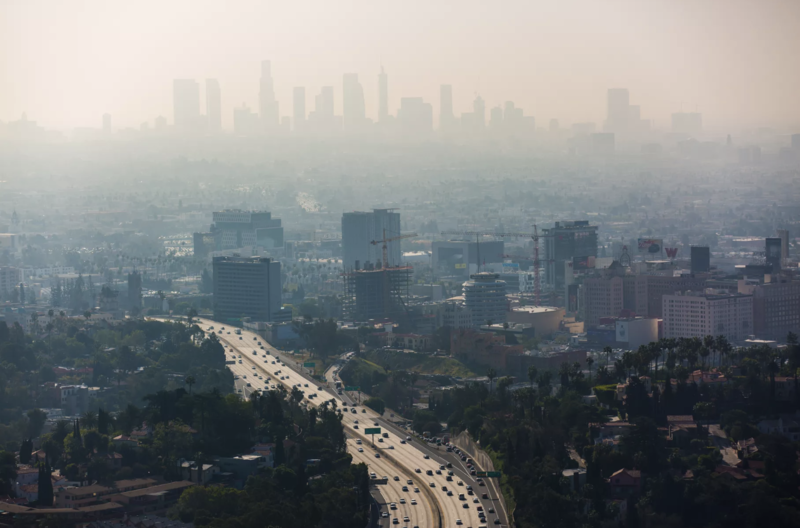 Since 1970, when the CEQA process was created, air quality has improved in Los Angeles. At the same time, the pace of housing construction has slowed precipitously, while rental pricesand the cost of buying a home have soared. It would be a big stretch to blame the policy for California’s current housing shortage (for which there are many causes), but critics have long complained that CEQA fosters uncertainty for developers about investing in California projects that could be held up for years in court. On the other hand, community members may not have wanted those projects in the first place. As KCET notes, CEQA lawsuits helped to prevent construction of the northern portion of the 710 freeway, which many community advocates now claim as a victory. State officials are now considering a few tweaks to CEQA’s guidelines. Proposed changes would adjust the way traffic congestion and greenhouse gas emissions are analyzed during the environmental review process. That could have an outsize impact on Los Angeles, where Metro is dramatically expanding its rail network. The proposed rule changes would make it far easier for transit agencies to give priority to trains and rapid buses, in situations when these vehicles share the road with cars. That could lead to frustration for drivers, but it would dramatically improve the speed and efficiency of public transportation in Los Angeles and other California cities.